Synthesizing an impressive variety of sources from memoirs and letters to histories and biographies, Lewis E. Lehrman explains how the Anglo-American alliance worked—and occasionally did not work—by presenting portraits and case studies of the men who worked the back channels and back rooms, the generals and the admirals, the secretaries and under secretaries, ambassadors and ministers, responsible for carrying out Roosevelt’s and Churchill’s agendas while also pursuing their own. Such was the conduct of Joseph Kennedy, American ambassador to England often at odds with FDR; generals George C. Marshall and Dwight D. Eisenhower; spymasters William Donovan and William Stephenson; Secretary of State Cordell Hull, whom FDR frequently bypassed in favor of Under Secretary Sumner Welles; the Soviet spy in the leadership cadre of the US Treasury, Harry Dexter White, and his struggle with Lord Keynes; British ambassadors Lord Lothian and Lord Halifax; and, above them all, Roosevelt and Churchill. The President and the Prime Minister had the difficult task, not always well-performed, of managing their subordinates. 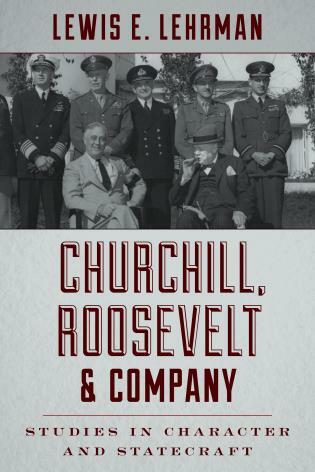 Churchill and Roosevelt frequently chose to conduct foreign policy directly between themselves, and with Stalin. Scrupulous in its research and fair in its judgments, Lehrman’s book reveals the personal diplomacy, the character and statecraft, at the core of the leadership of the Anglo-American alliance. Lewis E. Lehrman was presented the National Humanities Medal at the White House for his work in American history. Lehrman has written for the Washington Post, New York Times, Wall Street Journal, The Finest Hour, National Review, New York Sun, Harper’s, The Churchill Project at Hillsdale College, and The Chartwell Bulletin. Lehrman authored Lincoln at Peoria: The Turning Point (a history of Mr. Lincoln’s anti-slavery campaign from 1854 to 1865); Lincoln “by littles” (a book of essays about President Lincoln); and, Money, Gold, and History (essays analyzing the modern history of money and its role in civilization), among other books. Lewis E. Lehrman and Richard Gilder established the Gilder Lehrman Center for the Study of Slavery, Resistance and Abolition at Yale University. The Gilder Lehrman Institute of American History has developed a highly acclaimed national program for teaching American history in high schools and colleges throughout America (www.gilderlehrman.org). Lehrman received a B.A. from Yale and an M.A. in history from Harvard. He was a Carnegie Teaching Fellow in History at Yale and a Woodrow Wilson Fellow in History at Harvard. He has been awarded Honorary Degrees from Babson College, Gettysburg College, Lincoln College, Marymount University, and Thomas Aquinas College.